Committee to Elect Jeff Noble hasn't added a story. Jeff Noble was born to a working class family in Wilmington, Ohio. Jeff graduated from Francis Marion College in 1984, where he met Myra Kay Rhodes. The two were married on February 28th, 1987, and began to pursue their own American dream. Their family grew with the arrival of three daughters: Taylor, Brittany, and Brooke. After working in management, purchasing, and sales, Jeff answered the call to full-time ministry. In 1993, the Noble family sold their home and most of their possessions and headed to Wake Forest, N.C. and the Southeastern Baptist Theological Seminary where Jeff graduated with a Master of Divinity degree in 1996. The Nobles have called Michigan their home since 1999 when Jeff took a position as lead Pastor of Main Street Baptist Church in Canton. Under Jeff's leadership, Main Street Baptist soon outgrew their facility. In 2008, Jeff partnered with First Baptist of Plymouth to form Praise Baptist Church. Jeff is a husband of almost 30 years, a father, and a grandfather. He is a servant of God, his family, and the people of his congregation. Jeff Noble is once again answering the call; this time to serve the people of the 20th district as their Representative in the Michigan legislature. Committee to Elect Jeff Noble hasn't posted any updates yet. 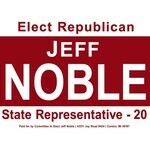 Committee to Elect Jeff Noble is managing the funds for this campaign.